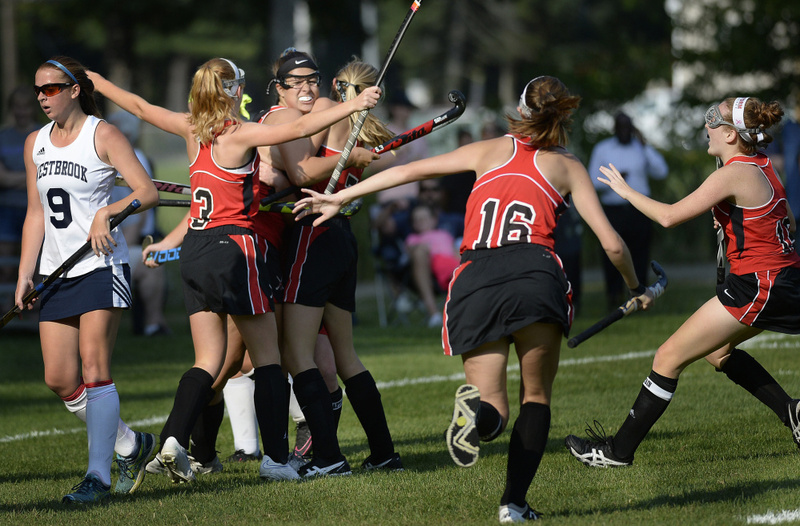 Lauren Topchik scores in the first half and Scarborough defeats Westbrook, 1-0. 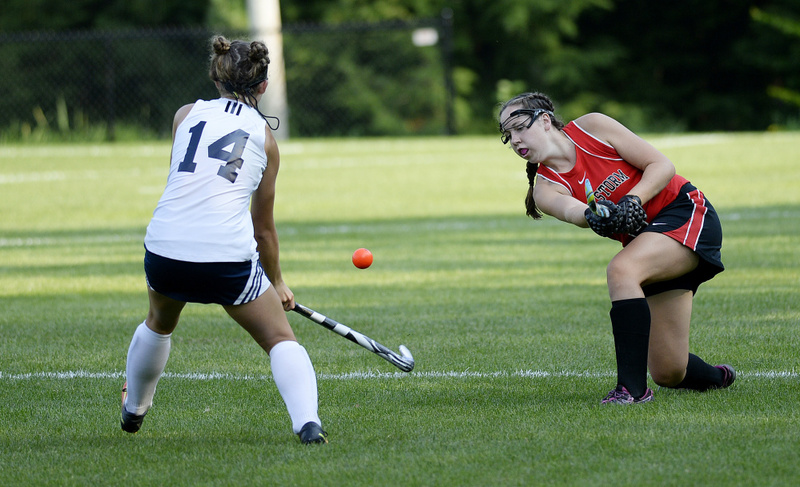 WESTBROOK — Lauren Topchik scored a first-half goal and Scarborough made it stand up Friday for a 1-0 victory against Westbrook in an SMAA field hockey game. Lucy Malia set up the goal, bringing the ball down the right and in toward the circle before crossing to Topchik for a pop into the cage after 25:42. Sam Carriero made three saves for the Red Storm (6-0). Kim Goddard blocked five shots for Westbrook (4-1). CHEVERUS 1, GORHAM 0: Lucia Pompeo’s overtime goal lifted Cheverus (4-1) over the Rams (4-2) at Gorham. Pompeo charged to the net on a breakaway and slotted home the shot at 6:13 of overtime. MASSABESIC 3, BIDDEFORD 1: The Mustangs (5-0) got first-half goals from Emma Rutledge and Camryn Champlin and a late goal from Morgan Pike to secure a win over the Tigers (4-2) in Biddeford. Sarrah Marcotte cut Massabesic’s lead to 2-1 with 13 minutes remaining, but Pike’s goal off a penalty corner with 6:48 left put the game out of reach. Maddy Pomerleau finished with 13 saves for Massabesic. Biddeford’s Taylor Wildes made 21 saves. DEERING 1, PORTLAND 0: Allisen Donovan slipped the ball into the cage at 28:14 of the second half, lifting visiting Deering (1-4) over the Bulldogs (0-5) at Portland. Maddelena Lapomarda had three saves for Deering. Jada McIlwain made nine saves for Portland. 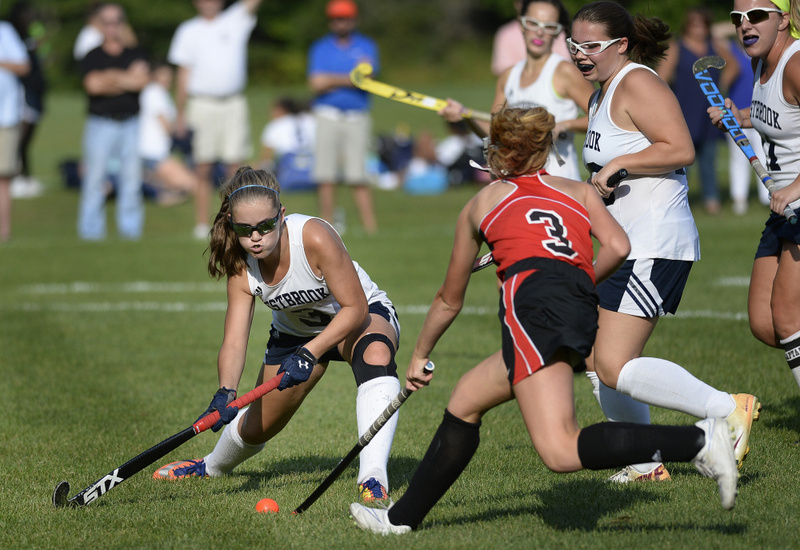 BOOTHBAY REGION 4, OAK HILL 1: Sydney Meader scored two of her game-high four goals in the first half as the Seahawks (5-1) opened a 2-0 lead and rolled past the Raiders (3-3) at Boothbay Harbor. Meader converted a penalty corner three minutes into the second half before Maegan Sheehy answered for Oak Hill from Zoe Buteau. Emily Amaral stopped 10 shots for the Seahawks. Mackenzie Thibault had 16 saves for the Raiders. KENNEBUNK 3, SOUTH PORTLAND 0: Brittney Gregoire scored two goals as the Rams (2-3) shut out the Red Riots (3-3) at South Portland. Lindsey Gregoire opened the scoring unassisted after 16:19. Brittney Gregoire scored five minutes later to give Kennebunk a 2-0 halftime lead, then added a goal with 12 minutes remaining. Maddie Drolet stopped 10 shots for South Portland. THORNTON ACADEMY 5, BONNY EAGLE 1: Taylor Ouellette scored twice to stake the Trojans (4-2) to a 2-0 halftime lead over Bonny Eagle (1-5) at Saco, then added the first two goals of the second half to widen the lead to 4-0. Olivia Lambert made it 5-0 before Arianna Mejias broke through for the Scots with 12 minutes left. Cat Henaire had three assists for Thornton. FALMOUTH 1, WINDHAM 0: Stone Carmichael scored on a setup from Mary Kate Bayer with 17:45 remaining in the first half as the Yachtsmen (3-3) edged the Eagles (0-5) at Falmouth. Grace Sawyer turned back 17 shots for Windham. Caitlin Bull recorded 10 saves for Falmouth. CHEVERUS 2, FALMOUTH 0: Lauren Jordan broke a scoreless tie 17 minutes into the first half, scoring from Michaela Jordan, and the Stags (3-1) went on to beat the Yachtsmen (2-3) at Portland. Emma Gallant put Cheverus ahead 2-0 at 38:53 of the first from Zoe Mazur. Kathryn Caldwell stopped two shots for Falmouth. GORHAM 0, DEERING 0: Gianna Charest stopped 16 shots for Deering (1-2-1) and Michelle Rowe made one save for Gorham (3-1-1) in a tie at Portland. 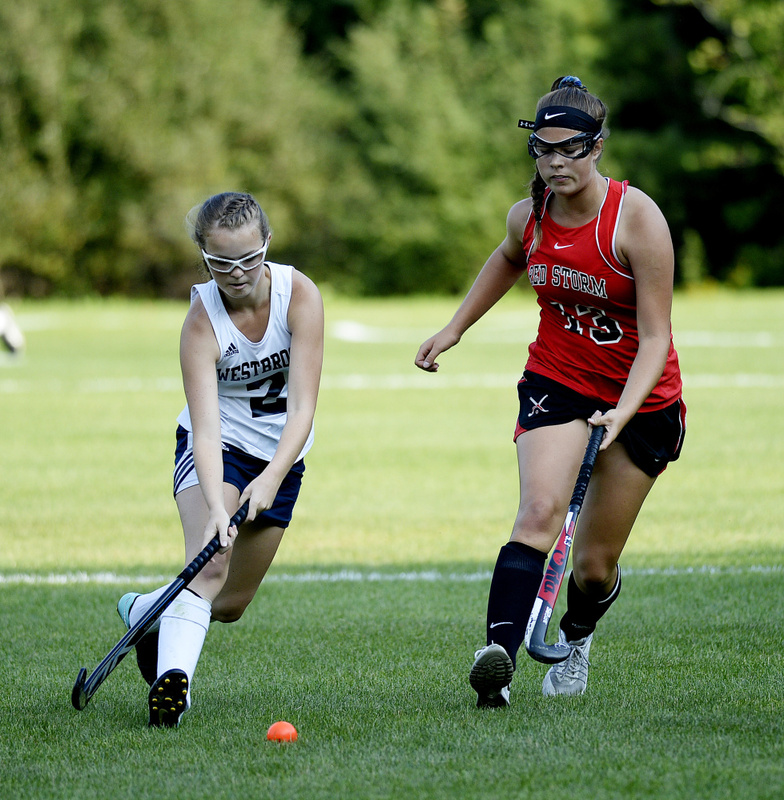 WESTBROOK 4, MASSABESIC 2: Allie Petry scored the go-ahead goal late in the second half as the Blue Blazes (1-3) rallied from a 2-1 halftime deficit to beat the Mustangs (0-3) at Westbrook. Ally LaPierre, who scored two goals, put Westbrook up 1-0 early, but Massabesic got goals from Madi Drain and Emily Baker for its 2-1 lead. 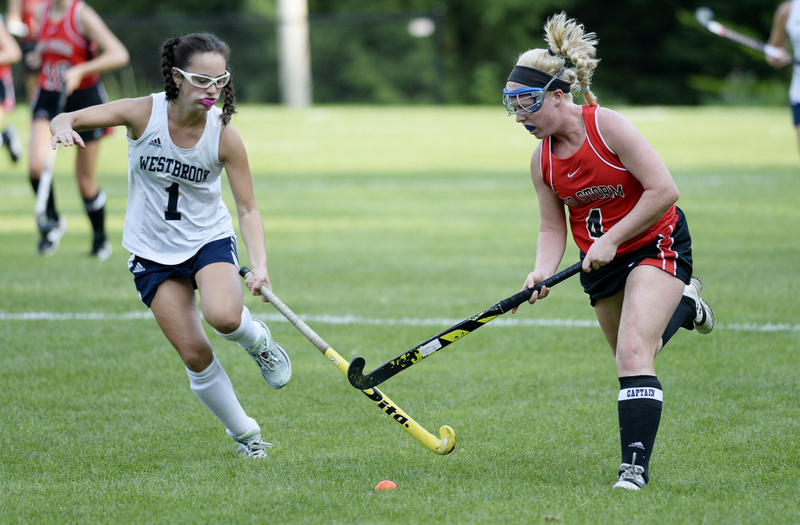 LaPierre tied it early in the second half and after Petry put in her go-ahead score, Angelica Johns added a last-minute goal for Westbrook. RICHMOND 13, VALLEY 0: Caitlyn Kendrick scored three goals and Abby Johnson added two as the Bobcats (3-2)beat Valley (0-4) at Richmond. Rilie Irish, Makayla Bergeron, Sydney Tilton, Emily Snowden, Leah Wescott, Lindsie Irish, Bre Vintinner and Emily Carbone also scored. Jada Ward had 15 saves for the Cavaliers. WAYNFLETE 3, TRAIP ACADEMY 1: Ilyas Abdi scored two goals and Burr Rhoads broke a scoreless tie late in the first half as the Flyers (3-0) downed the Rangers (4-1) at Portland. Abdi extended the lead to 2-0 less than two minutes later off a pass from Thorne Keiffer. Jayce Nielson made eight saves for Traip. CAPE ELIZABETH 2, FRYEBURG ACADEMY 0: John O’Connor scored both goals unassisted in the first half as the Capers (3-1) cruised past the Raiders (1-3) at Cape Elizabeth. O’Connor scored his first after seven minutes and extended the lead in the 20th. Cullen Pietrantonio stopped 16 shots for Fryeburg Academy. TEMPLE ACADEMY 8, GREATER PORTLAND CHRISTIAN 0: Noah Shepherd and Nikola Kekie scored two goals to lead Temple (4-0) over the Lions (1-2) at Waterville. Nathan Riportella, Ilija Ivkovic, Sawyer Derosche and Josiah Bartlett also scored. RICHMOND 9, VALLEY 0: Zach Small had four goals and two assists to lead the Bobcats (4-0) over Valley (1-3) at Richmond. Matt Rines chipped in with three goals and an assist, Nate Kendrick had a goal and two assists, and Nick Stillwell also scored.